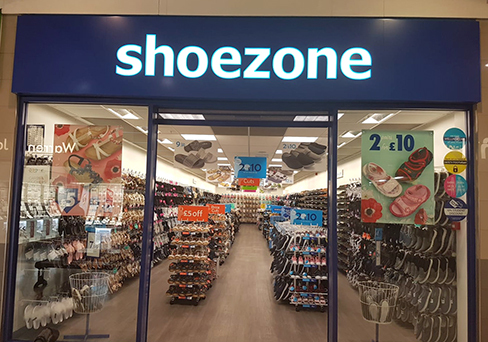 Don't usually shop at Shoezone but I like Earth Spirit shoes so I ordered online and picked up in store. Unfortunately they wasn't what I wanted but I was able to return them whilst I was there which saved time. Would be much better if you actually had these in the shop though. Shop Assistant Mari as very friendly and helpful. Slight criticism your shops always seem to be too "packed". You can't move easily down the aisles especially if you have lots of shopping bags. The girl that helped me had very good customer service i got a pair of black lace up shoes for a father's day gift for my dad.The pair i looked on the shelf had stitching out of the shoe.I picked the right shoe size and colour i wanted.I explained to the girl she apologized and got me another same pair from the warehouse.I was very pleased with the customer service off her and the price was a bargain too! !.I could not thank the girl enough as she was very polite and very helpful. Really unimpressed with the visit today.... Asked the staff about what size shoes my son might need to get a snotty reply of "we aren't trained to measure feet, we only advise." and then i was left to it.... I found it rather annoying that all the girls school shoes were right near the front of the store and the few boys ones were right at the back and there was only one style one display in the right size and there we no girls wellies out on display, even though the store had just opened and the woman, couldn't fetch any shoes or wellies from downstairs as "she was the only one in"... When we were paying for the items the woman didn't seem to like the fact that i let my 3 year old give the money over to her, even though we were the only ones in the store at the time... It's highly unlikely that I will be returning to the store again and will be going else where in future!! !